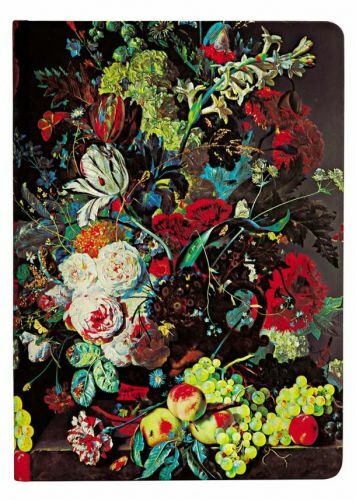 More sumptuous and surprisingly lifelike than the finest arrangement on your table, our journal cover is based on a painting by Jan van Huysum (1682–1749) that seems to burst off the page. A seduction of the eye and a jolt of passion for the soul, this still life is anything but static. Instead, colours and details entice. Van Huysum is perhaps the greatest master of that most revered subject in the Dutch artistic canon: the flower. Dutch still-life painting represents the pinnacle of the form and nowhere is it on such magnificent display as in this, his Still Life with Flowers and Fruit. Using tightly packed blooms, abundant fruits and vegetation, the artist also conjured up piquant details, such as a single insect or a drop of dew to lure onlookers. He was notoriously private about his process and would allow no one in his workshop lest they learn the secrets of how he created and applied his colours. Like the flowers he painted to such effect, his artistic process was fascinating to others but resisted full understanding in its brazen-hued showiness. This season we are pleased to bring Van Huysum’s vibrant style to our collection as not only a journal but a pencil case as well!